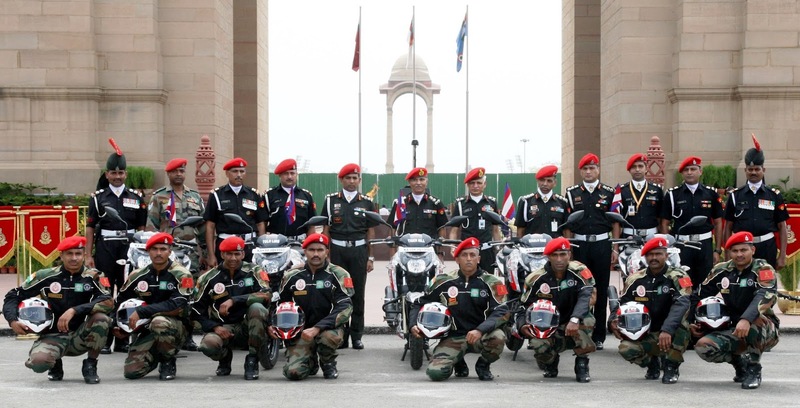 Shwet Ashwa, the elite motorcycle display team of the Corps of Military Police, commenced a motor cycle expedition from Bengaluru to Drass on 2nd July 2018 as a tribute to the soldiers who laid down their lives during the Kargil war. After a gruelling ride through the Western Ghats and encountering heavy rains at Mumbai and Jaipur, the expedition reached New Delhi on 13th Jul 2018 from where it will be flagged off for Drass on 16th July 2018 by the Adjutant General Lt Gen Ashwani Kumar, AVSM, VSM. 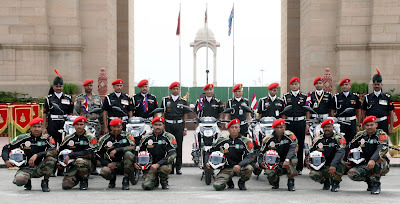 The expedition is being undertaken by five highly experienced riders of the Army’s Shwet Ashwa Motor Cycle Display team and will travel a distance of more than 3250 km across eight states before they reach Drass on 24th July 2018. At Drass, they will participate in the Vijay Diwas celebrations to commemorate India’s Victory in the Kargil war and pay homage to the 527 brave soldiers who sacrificed their lives during this operation. The riders on their 200cc TVS Apache RTR bikes have already covered approximately 2500 km and will now commence the most treacherous phase of their ride while they pass through Manali, Sarchu, Leh and Drass. They will face the most challenging terrain and weather and both man and machine will be put to the ultimate test of endurance during this phase. DGNCC Lt Gen PP Malhotra flagged-in the NCC Boys Expedition to Mt Saifee on 11 July 2018, here. He congratulated the boy cadets and the support staff for their splendid effort and demonstration of grit and courage to overcome the challenges of rugged terrain and hostile weather conditions in their bid to summit the peak. The expedition was launched on 01 June 2018. The expedition team left for Mt Saifee Peak on 04 June 2018 from Delhi lead by Expedition Leader Col Dhirendra Singh, Dy Leader Major Neeraj Singh Mann alongwith 15 PI Staff and 20 boy cadets. 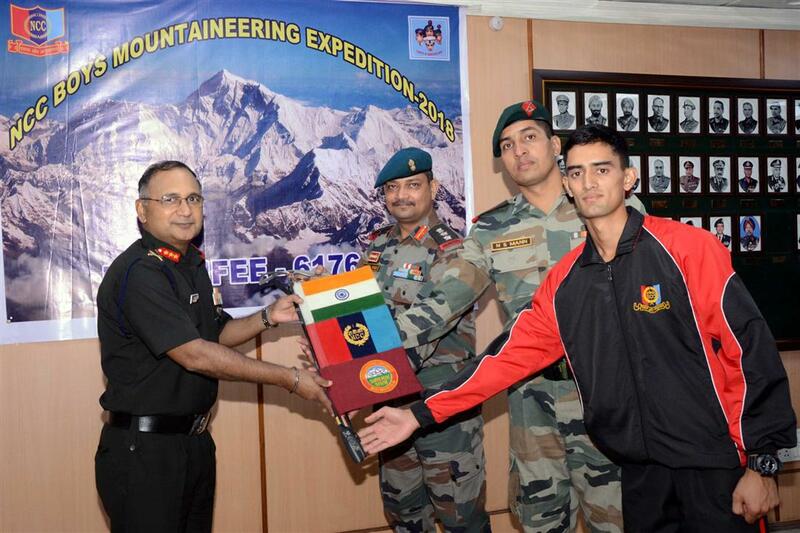 All the cadets were given mountaineering training in NIM, Uttarkashi for 10 days. The Expedition Leader Col Dhirendra Singh shared his experience and the challenges faced by the expedition team during their difficult attempt. Mt Saifee is situated in the beautiful Gangotri National Park and the Garhwal Himalayas. The peak is knows as Mountaineers Paradise. The successful summit of the peak by 18 NCC Cadets on 30 Jun 2018 gave them an exposure to the mountainous conditions and hones their spirit of adventure. During the interaction, DG urged the cadets to encourage their colleagues also to experience the multitude of adventure and sports activities offered by NCC. He said the expedition will help them imbibe the qualities of courage, comradeship, discipline, leadership and a spirit of adventure amongst the NCC cadets. Every year NCC conducts mountaineering expeditions for girls as well as boys to strengthen their spirit of adventure and imbibe in them the qualities of leadership, tenacity, discipline and courage. INS Tarangini arrived at her seventh port, Sunderland in the UK, during her Lokayan-18 voyage and also to participate in the prestigious ‘tall ship races - 2018’. The ship is part of the first Training Squadron based at Kochi, under the Southern Naval Command of the Indian Navy. The name ‘Tarangini’ is derived from the Hindi word ‘Tarang’ meaning waves; thus, Tarangini means ‘the one that rides the waves’. INS Tarangini is the first ship of the #Indian Navy to have circumnavigated the globe in the year 2003-04 and has participated in tall ship races conducted around the world in 2007, 2011 and 2015. This beautiful ship, in her 21st year of service, is once again ready to create history with #Lokayan-18. Lokayan is a combination of two Sanskrit words: ‘Lokya’ meaning worldwide and ‘Yana’ meaning travel, thus literally meaning, ‘travel around the world’.